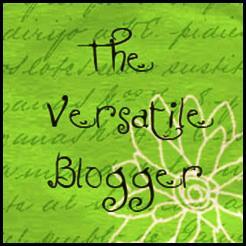 A new follower, Chris Sheridan, nominated me for an award–The Versatile Blogger Award. So a hardy shout out to Chris and a big thank you are overdue. I don’t know if this award can be given to pro or semi-pro bloggers (that make money or at are supposed to be). In any case here are my 15 nominees, in no particular order, for The Versatile Blogger Award. 1. http://heretherebespiders.wordpress.com/ – an expat American living in Ireland…this lady blogs about her life in general to include pets, ale, art, personal experiences, the holidays, i.e., everything. And she’s got a great sense of humor too. 2. http://www.politicalruminations.com/ – although this is mainly a political blog, if you take a look at the number of categories she covers you will find that she knows an awful lot about a lot of different topics–most good political bloggers have to know about all kinds of things that affect public policy. So IMHO she deserves this award. And if you like someone who engages in rational debate and someone who is able to show passion while doing it, this is your type of blog. 3. http://motleynews.net/2012/01/11/happy-hump-day-funnies/ – Just like the title says, a motley collection of things from the author’s days and forays on the Internet. My recent favorite was the collection of “Hump Day” photos. 4. http://planetross.wordpress.com/ – this man is seriously silly and I love it! He has personal posts, stick figure animations, pop cultural posts….too hard to describe…you just have to experience it. 6. http://sarcastbastard.blogspot.com/ (not a wordpress blog but still funny as hell)–this guy rights about everything with, you guessed it, sarcasm. Be careful though…if you’re offended by cursing, this isn’t the site for you. 7. http://bipolarized.wordpress.com/ – another personal blog, the author touches on a lot of topics that swirl around the central focus of living with a mental illness. 8. http://mennogirl.wordpress.com/ – a young woman living in Chicago who lets us into her life through her efforts in “self expression”. 10. http://rudepundit.blogspot.com/ – this guys is friggin hysterical! He writes about whatever comes to mind, politics mainly but enough cultural references to make it into the versatile blogger arena. Again, if you don’t like cursing, then don’t read his blog. He calls himself “rude” for a reason. 1. My toes are very long and flexible. I can use them to pick things up, to pinch someone, etc. 3. I am #6 out of 7 kids in my family. 4. I get tired of all the sunshine in AZ (see #2 as to why). I would prefer seasons. 7. I’ve been in at least five life potentially threatening situations during my stay on planet earth. In 4 of 5 of those incidents things immediately went into slow motion and a voice in the back of my head (mine, not the “other ones” ha ha) stayed calm and helped me react properly. I think because the events slowed down, I can remember a ton of details to this day. The 4 incidents included: a fall off a very tall ladder, another fall off a cliff face, a mass attack of bees, and a multiple car pileup. The fifth incident was a near drowning and someone (my future stepmother actually) saved my life.